Ever since private companies and government started using computers there has been someone making the decisions on what technologies to leverage. In the beginning options were limited so choices were easy (albeit expensive). Entities adopt methods of sharing information and for better or worse stick with the plan over the course of a decade or longer. As fast paced as the industry is, there have only been a few leaps that have changed the game entirely but they all add up to where technology fits in today's workplace (and for that matter where it's going). 1. Cheap Computers: Once computers got cheap enough, they became ubiquitous. Numbers one and two are past tense so let's focus on three. The Great Tech Organization, or so I call it. Allot of people refer to it as web 2.0, 3.0, cloud or Generation Y computing. Whatever nomenclature you tag it with the idea is the same, to untangle the lack of standards from the Internet boom and really start using information efficiently by making access platform transparent (my name is still the best, however). "The Great Tech Organization" made possible incredibly powerful applications that we all use (ok, unless you are over 35 - we'll get to that later) daily. Interconnected (via standards) cloud applications and methods like tagging, Facebook, Google Apps, YouTube, Twitter etc are all built in a way to share the information they contain freely at will with anyone, or any application that chooses to access it. This did a number of things but mainly it allowed anyone from the best application engineers down to shade tree developers to tap into incredibly powerful specialized central systems to enhance their own applications while allowing the people to decide what data they need. So... That's why there is a embedded youtube videos on every random website out there.. hmmm. Thats why I can view what 200 of my friends have on their mind right now, from my Blackberry - and react if I want to. Let the people have the data and they will figure out what to do with it, that's the idea here. Once all these systems had a way to communicate, other than via browser (which required a human), the internet starts to become a less chaotic, more effiecient, and more organized place to live. So here we are in 2009 with all of these great applications at our disposal on demand. At no other time could the average Joe access so much information so quickly. So we use all this information socially, is big business taking note? The Digital Split in today's businesses: There was a time that one generation of people who didnt grow up with computers disregarded them, computers were almost entirely embraced by the youth but not their parents. That's what I call the "Analog Split". Today most everyone uses a computer to communicate in one way or another and for the most part people have adopted the internet as here to stay. What we see now is the Digital Split, where one generation of business is used to doing things the old fashion way (centralized in house servers, email messaging, custom specialized applications) and the current/future way (cloud computing, social networking, and web 2.0 applications). So who is adopting the new methods? Which side of the Digital Split is your company? Let's look at the feds. The US Government is actually doing a great job in my opinion, with at least part of the solution, and much better than many large companies (yep, I said it). This is largely due to allot of youthful influence on new policy when it comes to IT and a new administration willing to roll the dice. They are starting by communicating with the masses. 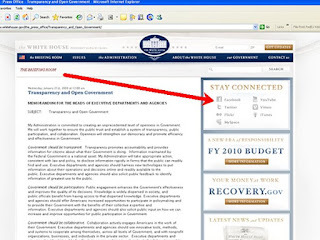 The president spells this out as the new government vision in a January 2009 briefing from the White House. You'll notice the White House has it's own YouTube channel and Facebook page (as does the State Dept, and so on and so on..). Obama pushes twitter updates constantly. It's not 100% effective yet, or nearly close, but you can see that they take it seriously. Take a look at the Data.gov project and you will see the feds are also putting open access methods into practice also (someone up there is on the right side of the split). It's not just a way for the country to promote its agenda (it is) but it's also the new way of doing business. The people have adopted these methods to communicate personally, why shouldnt business? I say they should, if you want to remain competitive. So take note of which side of this digital split your company is on. The lines between personal and professional computing are blurring by the day. The smart money rightfully recognizes the power this brings. Skills that will be in demand in the future may revolve around YouTube, Facebook, or anything else your boss doesn't want you using while at "work". For the first time since the internet, the people are ahead of business in way they think about sharing information. Besides, 1 million heads are better than, say.. one - right?